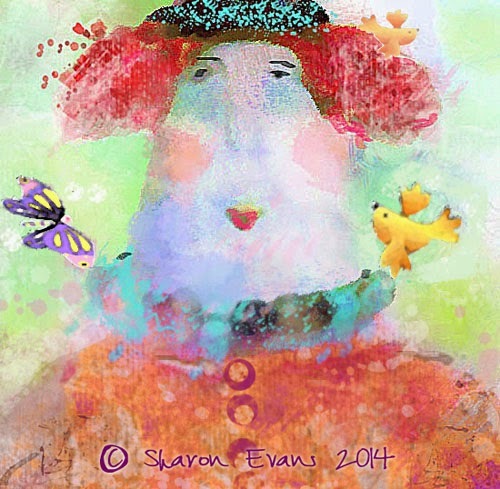 It is ages since I have taken part in challenges seriously and as I have got into the blogging mode again I thought I would take part in the 29 Faces September 2014 challenge hosted by Ayala Art. Above is Face 1 and I realised that after I had added the butterfly and birdies that this lovely would fit in with Susi and Valeries September theme of Living Beings at Art Journal Journey. After all my lovely is completely bemused by these lovely fluttering beings. 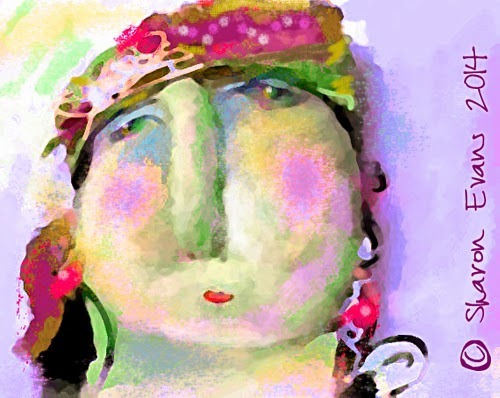 Face 2 is a ‘lovely’ wearing a gorgeous hat. I am thinking that I might make hats a theme for 29 Faces, we will see! Have a wonderful week and hope to post some more faces in a couple of days! Oh my!! Absolutely love these faces!! Wow!! Oh my goodness....I LOVE LOVE LOVE these gals so much....I want to buy prints from you!! Can not wait to see the rest....I am SOOOOO excited about these gals!! Good job! Have a line of cards made with these two!! You have inspired me so much!! Your lovely ladies are each so fanciful and original...precious birdies too! I am in love with your faces Sharon! Thanks a lot for playing along with us at Art Journal Journey - Living Beings! Oh, Sharon ~ what wonderfully expressive faces! And I adore your use of color. Love these ladies! Oh Sharon I love these ladies! Fantastic and whimsical! ♥ So happy to see you in the challenge! These are hilarious and unique, well done!! I love this wonderful, awesome painting! oh my goodness, these are wonderful! Really! How do you do these wonderful color combinations and the marvellous expression on your ladies faces? I admire your work so much and I wish I would be able to paint faces this way too. I love love love both ladies! And good luck for the 29 faces challenge! I love your color and whimsy!!! Great faces! Can't wait to see more!